Few weeks ago Ross Turk, SourceForge Community Manager, went to LinuxTag to find out more about the open source community in Germany. While in Europe, he decided to visit me in Italy to do the same thing. Adding value to value: the SF marketplace might address the needs of SMBs looking for single developers or small firms, but could also respond to the medium size enterprises’ needs, looking for complete IT services. Sooner or later Cross-selling, Up-selling and Down-selling will find their way, I guess. Tell me a little bit about yourself. How did you get where you are today? I started working for SourceForge in May of 2000. Of course, we were called VA Linux at that time, and I was an engineer in the Professional Services team. Shortly after I started, we began getting requests to install corporate instances of SourceForge.net, and I was among a handful of engineers initially performing those deployments. After a while, VA Linux decided to turn what we were doing into SourceForge Enterprise Edition and become VA Software. I stayed on and became a PS Architect, where I met with customers and did some of our heavier customizations. In about 2005, I was looking for a change. I asked to be moved to the SourceForge.net team, where I became the Engineering Manager. The two years I spent in that position were a tremendous education for me! Very few people get the opportunity to be so closely involved in the architeture and operation of such a large web site. However, the more I learned about the site, the more I began to see the need for better communication with our user community. The minimal time I could devote to community-based activity just wasn’t enough. In the last half of 2006, it became clear that it could use someone’s full-time focus – I asked for the job, and that’s what I’m doing now! You’re the Community Manager for SourceForge.net. What does that mean? Our team is now more focused on what will make the community successful than I’ve ever seen it. Certainly, the position of Community Manager isn’t like anything SourceForge.net has had before. When you reduce it down to its simplest form, my job is to talk to as many people in the SourceForge.net and open source communities as possible. I am here to spread the word about SourceForge.net and ensure that our constituents know what we’re up to. More importantly, I’m here to provide my organization with the “eyes and ears” that it needs to help our community members succeed at what they’re trying to do. I think that if the members of our community are successful, we will be too. I think that I just may have the coolest job of anyone I know. I get to talk to the smartest, most innovative, and most passionate people in the industry, and I get to travel the world while I’m doing it. What has the SourceForge.net crew been up to recently? We just launched the open beta of the SourceForge.net Marketplace, a set of tools on the site that allow our community to buy and sell goods and services from one another. Using these tools, any member of our community with expertise on a particular project or technology can make their services available to everyone else. I think these features will be invaluable – not only for developers looking for a way to financially support their open source work, but also for end users looking for access to those most familiar with the technology they use. It’s a whole new direction for the site, and our team is really excited to be working on something fresh! We also introduced wiki functionality into our project toolset through a collaboration with Wikispaces. Their wiki tool is full-featured and user-friendly, and having their help allowed us to release this functionality a lot quicker than if we’d have written it by ourselves. Needless to say, we expect this to become a large part of our projects’ tool arsenals. However, the nearest and dearest to me is the SourceForge.net Community Section. As I’m writing this, it’s still being built…[now live, see it] but by the time your readers see this, it’ll probably be live at http://sourceforge.net/community. It consists of a blog we can use to talk about our feature roadmap, make announcements, and highlight some of the personalities in our community that readers might find interesting. It will also have a forum system that will allow users to discuss things related to open source and SourceForge.net. The first thing that I plan to promote heavily on the Community Section will be our Community Choice Awards, which entered their primary nomination phase a few weeks ago. 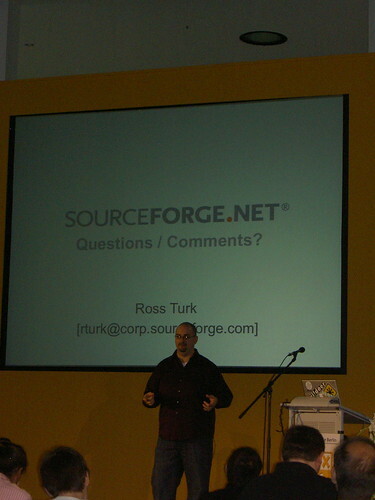 I would love to talk with your readers about any of these topics, or anything else related to SourceForge.net or open source, and I can always be reached at rturk@corp.sourceforge.com. Thanks for taking the time to write about what we’re up to! Thank you Ross for your answers, happy hacking! Open Source Marketplace: SourceForge Advisory Board welcomes me! Hey Roberto 🙂 Thanks for the post. I forgot to add – if anyone is interested in becoming a seller in our beta marketplace, they can add their name to our interest list here.